Hello, my friend! I have been thinking a lot about this past year on the blog and about all the fun stuff I want to do in the future, and something occurred to me. It’s been ages since I held a giveaway! So I figured it is time to fix that situation and bring some holiday cheer to my wonderful readers. I had an incredible time working on A Month in Color and getting in touch with my artist again. I knew I was a fan of artsy touches, but using a watercolor planner has really helped me feel like an artist, ya know? And I had so many incredible people cheering me on as I played with this new planning format. Seriously, you guys knocked my socks off with your support. So I have decided to give back to show you just how much I appreciate all the love. I have decided to create a watercolor planner starter kit and give not one, but THREE kits away to three lucky folks. Yup. Three. This is the biggest giveaway I’ve ever done, and I’m super stoked to share it with you! So what’s in this kit, you ask? Let me tell you! These are some of my absolute favorite supplies, so all come with a Shelby seal of approval. 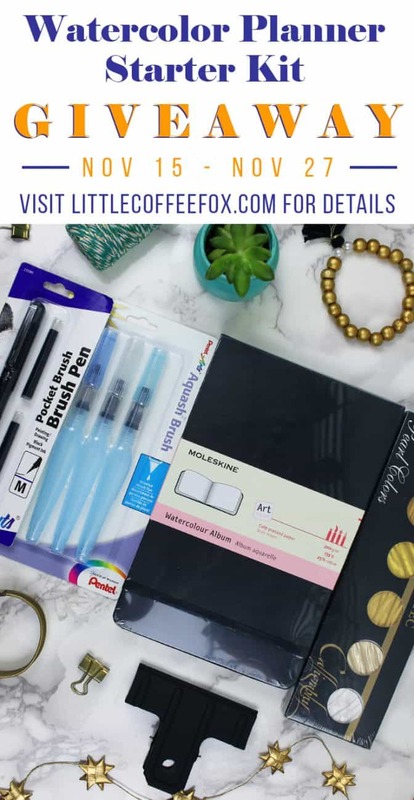 Each of the three winners will receive one kit to start their very own watercolor planner or simply start a really kickin’ watercolor sketchbook! Either way, these supplies are an excellent springboard for some truly fantastic creativity. 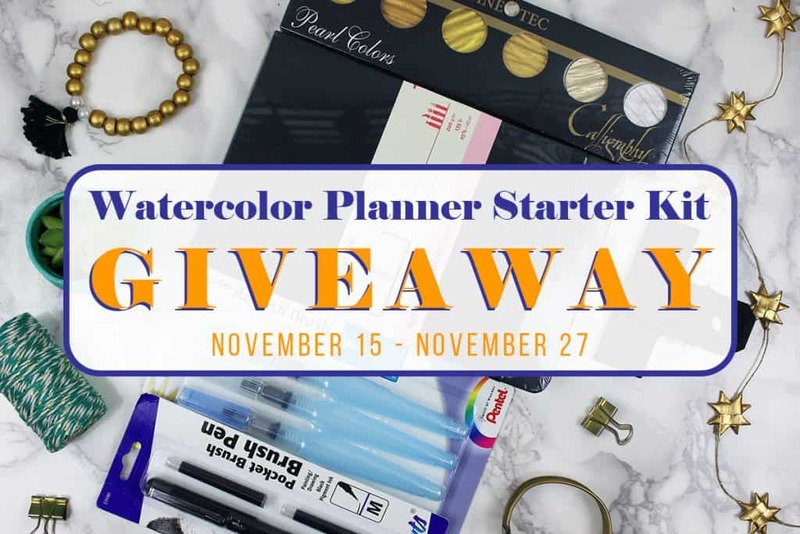 If you want to be one of the three lucky winners of a watercolor planner starter kit, then simply enter via the form below! There is only the one requirement for entering the giveaway, which is entering your email in the form (that will subscribe you to my newsletter if you aren’t already btw). However, if you want to up your chances significantly, then there are lots of ways to get bonus entries! For example, there’s the “Refer Friends for Extra Entries” option, which is like an extra entries bazooka. Basically, if you share the link in a Facebook group or email it to your friends and you get ten new people to sign up for the giveaway, then you get 100 extra entries! It’s not limited to ten people though, so you can share this thing like nuts and increase your chances exponentially. Or another thing you can do if you’re feeling zesty is write a blog post talking about the giveaway. That will gain you 50 additional entries and give you quite an edge (plus it would be super awesome to see your blogs!). While you’re filling out your extra entries, I hope you’ll check me out on social media and give me a follow! You need to fill out the minimum requirements of the form below. You need to enter before the giveaway closes (Nov 15th – Nov 27th @ 11:59 pm CST). The winners will be randomly selected within 72 hours of the giveaway ending. After that, I will reach out to the winners through email. If I don’t receive a response from the winners within a week of the email, then another winner will be selected to take their place. I’d love to be able to see your Etsy site but can’t spot s working link? Also I’m completely new to this journalling type of self help. I’m very stressed and depresssed and using all your info I am gradually learning how to kick start myself. So sorry about this Shelley! If you could send an email to us ([email protected]) we will then have your email address so we can look into it further for you. Thank you Nefer! Best of luck! Would love to enter this wonderful contest but as you state anyone living outside of the US must pay own custom’s fees and taxes and I unfortunately have issues with this method. Perhaps down the road arrangements can be make by sending by UPS or Puralator I’ve been very lucky getting items from the States with no problem and of course it does take a bit longer perhaps up too 2 weeks but my journal supplies are well worth it, and I find alot more on your Amazon.com site than here in Canada. Lots of luck to all the contestant. Just received a 24 set of Finetic multi colours palette today and can’t wait to try them out. Thanks for all the support and ideas to help get me started. Thank you for the information Joan! Your month of watercolour journal entries/art are just wonderful! Your talent is amazing and subject matter generates much thought to me each and every day. I love the variation in the daily entries! I, too, have a commitment issue and love the beginning of almost everything; however, when the new wears off, I start to need something else new and the last project gets neglected. Kudos to you for your perseverance and determination to stay true to this project! Thank you so much Celia! I really enjoyed it and I’m glad you did too. I’m sorry about that Sam! I’m not sure why you are experiencing a snag on that part of the form. I’ve tried and it works fine over here. Perhaps it was some kind of error on your computer. Could you give it another try and see if it works now? If it is still giving you trouble, please shoot an email to [email protected] and we can figure it out! So glad you enjoyed them and thank you for watching Sendie! Although I am not very active in commenting, I love visiting your page. Though I have a hard time keeping up with a planner ( after being inspired on your page I did manage to keep one for about a month and saw the amazing positive change, but in the end my energy in writing every day fizzled out because I have a hard time finding quality materials to make it pretty and have fun with it here in Bulgaria). If I don’t win, I think I’ll try and order some from the US in hopes that it will get it going again as I saw how well it helped me organize my days and my life. Thank you for the great inspiration. On a side note, I do play around with some of the ideas in the form of doodles or just random sheets of paper when writing memos for myself. You are very talented and creative, keep up the great work! This is hilarious, because I literally just asked my parents to get me a watercolor starter kit based on these materials that you outlined in your “how to get started with watercolor” post haha 🙂 Thanks for the inspiration!